Radical RC Anodized Red Aluminum fuel shutoff valve. Stop those messy fuel leaks at the source. Fits all common fuel lines up to 1/8" (3.2mm) ID. Handy parts to use anywhere you need to crimp off fuel flow. Units are retained on fuel line. May be used as fueling or starting aids in different situations. Slip yoke has screw mounting hole to use if desired. The Fourmost Auto Plug/One Way Valve can be used in a variety of instances that require the maintenance of air or fuel pressure in gasoline and smoke systems. The Auto Plug/ One Way Valve can be used in place of a plug in fuel systems that utilize muffler pressure. 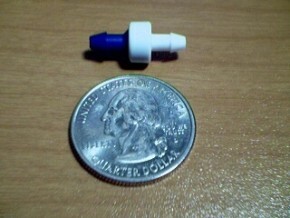 The Auto Plug/One Way Valve may also be used in conjunction with bladders to eliminate continual pinching of the line during the fueling process. The Auto Plug/ One Way Valve is also ideal for the pressure line between the muffler and the fuel tank to prevent pressure and fuel from escaping back into the muffler. This product may only be used with glow fuel. 1/16 inch ID, Barb is .175 (4.5mm) OD. The Fourmost Auto Plug/One Way Valve can be used in a variety of instances that require the maintenance of air or fuel pressure. The Auto Plug/ One Way Valve can be used in place of a plug in fuel systems that utilize muffler pressure.